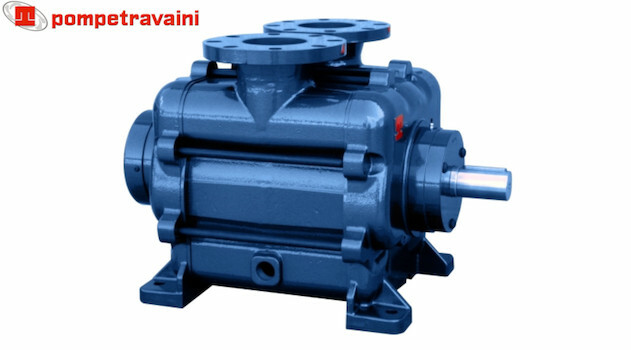 The series of single-stage vacuum pumps with liquid ring valves Travaini TRVX introduces a new and innovative approach to performance and reliability. It is the result of the Pompetravaini expertise and proximity with its customers and their applications. The result is a milestone in the design and production of liquid ring vacuum pumps offering tangible benefits to users. The new hydraulic profile allows a performance increase of over 10% compared to traditional liquid ring vacuum pump designs. It increases efficiency and saves operating costs during the entire working life of the pump. The pump weight is average 30% less compared with the traditional liquid ring vacuum pump designs with compact supporting components dimensions. This advantage allows simple installation and transportation costs saving. 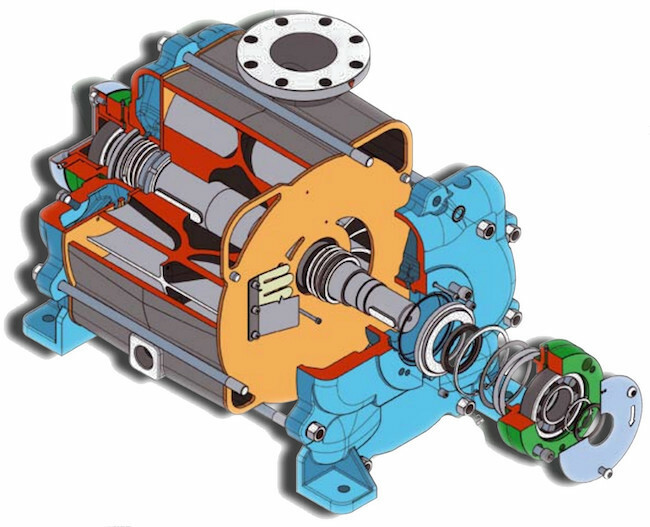 Compact dimensions and volume (L x W x H) 50% less compared with the traditional liquid ring vacuum pump designs. Optimisation of factory or plant installation spaces and related costs saving. Exploded view of a Travaini TRVX model. Easy pump fitting without the use of complicating piping. This ensures a fast and economic pump installation. Central body impeller housing with integrated suction and discharge manifolds with compact overall dimensions. This feature reduces pump components and increases robustness. The maintenance and assembly time and cost-saving result to be greatly advantaged. The suction and discharge port plates are always in stainless steel allowing a greater reliability through the time and ensuring stable performances. They never require to be replaced during ordinary maintenance reducing down on spare parts cost. Deze informatie wordt verstrekt met dank aan TravainiPompe SpA.